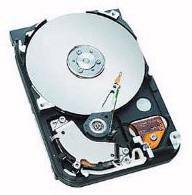 Your hard drive may show less space than the published specifications due to a number of reasons. 1. The way size is calculated and displayed. The definition of a megabytes (or gigabytes) is a unit of data storage capacity measured in 1,048,576 bytes (or 1024KB). The larger the numbers, the more apparent the size difference will be when listing the size as megabytes (or gigabytes) versus bytes. Actually, both numbers are correct. The noticeable difference is due to the 1024KB definition of a megabyte. 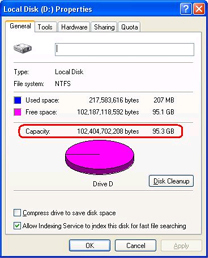 This is why a 95.3GB hard drive can also be listed as having 102 billion bytes of total space. Just think of it as "round off"
In the screen shot above: The first number is the total number of bytes, the second number is based on the number of megabytes or gigabytes. 2. Any "Partitions" on the disk will change the total in a specific partition. Some computers have a non-DOS hard drive partition that is used for features such as Save to Disk, Hibernation, or Recovery. This partition is not normally reported by the operating system, although it can be viewed using a disk partition utility. This is very common on desktops and laptops. NOTE: Partition information will be created or formatted automatically during initial system setup and a system recovery. 3. Hidden files and folders decrease available space. By default, all system files are hidden and cannot be seen. This may adversely affect the reporting of available hard drive space. You can set your Folder Options so you view system and hidden files and folders, but do be careful as changes to system files can adversely affect your system.